We use the multigrid implementation (rather than the default tree implementation) and either the MAC or the centered Navier–Stokes solver. Here we define the domain geometry: a square box of size unity centered on (0,0). We also set the viscosity and some parameters controlling the numerical scheme. We then call the run() method of the Navier–Stokes solver. 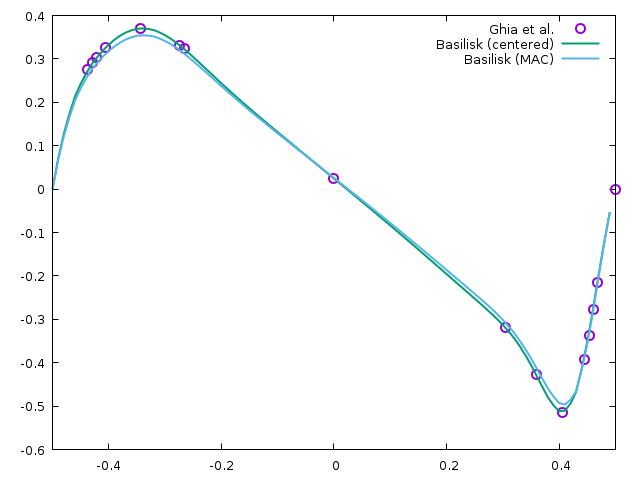 The default boundary conditions are symmetry (i.e. slip walls). We need no-slip on three boundaries and u=1 on the top boundary i.e. For the colocated solver, imposing boundary conditions for the normal components of the (face-centered) advection velocity improves the results. Ideally, this should be done automatically by the solver. We define an auxilliary function which computes the total kinetic energy. The function works both for face and centered discretisations of the velocity. We add an option to restore the simulation from a previous dump. We want the simulation to stop when we are close to steady state. To do this we store the u.x field of the previous timestep in an auxilliary variable un. Every 0.1 time units we check whether u has changed by more than 10-5. If it has not, the event returns 1 which stops the simulation. We also output the evolution of the kinetic energy on standard error. Every 100 timesteps we output a binary representation of u.x bilinearly-interpolated on an N x N grid. We dump a snapshot which can be used to restart the simulation. This event will happen after completion of the simulation. We write in the xprof and yprof files the interpolated values of u.x and u.y along the two profiles. Horizontal profile of the y-component of the velocity on the centerline of the box.